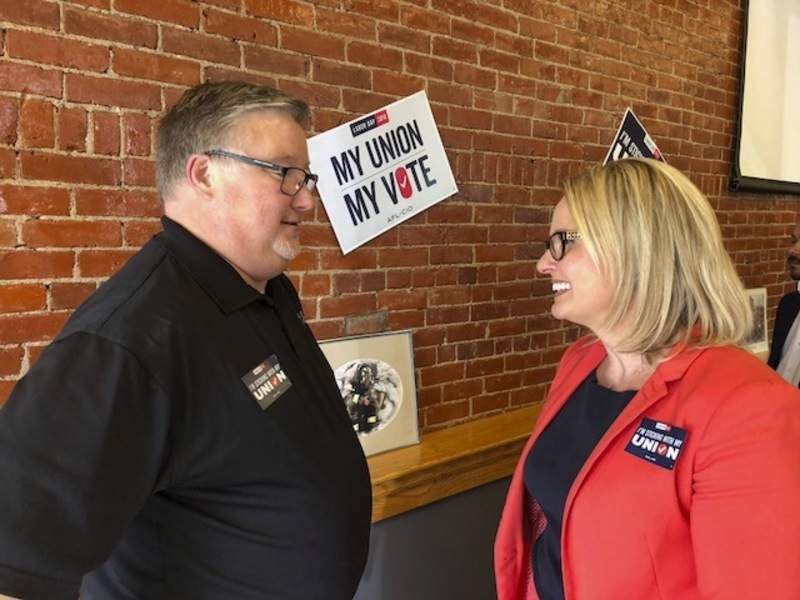 Brian Francisco | The Journal Gazette Brett Voorhies, president of the Indiana State AFL-CIO, speaks Thursday with Democratic congressional candidate Courtney Tritch at a union hall in Fort Wayne. The president of the Indiana State AFL-CIO predicted Thursday that organized labor will be celebrating after the Nov. 6 general election – provided union members cast votes in large numbers for labor-friendly candidates. “We're out there. We're hitting the doors, we're making the phone calls, we're doing the digital – more digital than we ever have in the past,” Brett Voorhies told about 40 people gathered at Fort Wayne Professional Firefighters Local 124 on Broadway. The Indiana State AFL-CIO is a labor federation representing 400 unions and 300,000 union members. Voorhies said 77 percent of them voted in 2016, when overall voter turnout was 58 percent, according to the Indiana secretary of state's office. The election outcome “wasn't what we wanted, but we turned them out,” said Voorhies, a former Indianapolis steelworker who has led the federation since late 2013. He expressed confidence that labor-backed candidates will win legislative seats in November because of an “incompetent” President Donald Trump and Republican Congress. “After Election Day, we're going to have a lot to celebrate,” Voorhies said. He singled out for praise Democratic U.S. Sen. Joe Donnelly, unopposed Democratic state Rep. Phil GiaQuinta of Fort Wayne and local resident Courtney Tritch, the Democratic challenger in northeast Indiana's 3rd Congressional District. They are among 76 candidates in Indiana – all but one a Democrat – the AFL-CIO has endorsed for state and federal offices. “We want worker-friendly people elected to office. It's critical,” said Lloyd Osborne, president of the Hoosier Heartland Area Labor Federation. The federation also will be talking to workers at plant gates and sending mail to union members ahead of the general election, according to a news release. In a later interview, Voorhies acknowledged “there are scars” from the 2016 election, when Trump defeated Democrat Hillary Clinton by 19 percentage points in Indiana and Republican Eric Holcomb beat Democrat John Gregg by 6 points for governor. Northeast Indiana is heavily Republican; Trump won at least 69 percent of the vote in all its counties but Allen. Why doesn't the AFL-CIO write off this region of the state when it comes to political activism and use its resources elsewhere? He said he spent a lot of time in Fort Wayne working with local labor officials who fought the City Council's 2014 decision to end collective bargaining for municipal employees other than those in the police and fire departments. Organized labor's annual free Labor Day picnic will be 11 a.m. to 3 p.m. Monday at Headwaters Park in downtown Fort Wayne. Food, beverages, bingo and children's activities will be provided. The picnic is “a gift back to the community from organized labor,” said Darryl Esterline, executive vice president of the Northeast Indiana AFL-CIO.